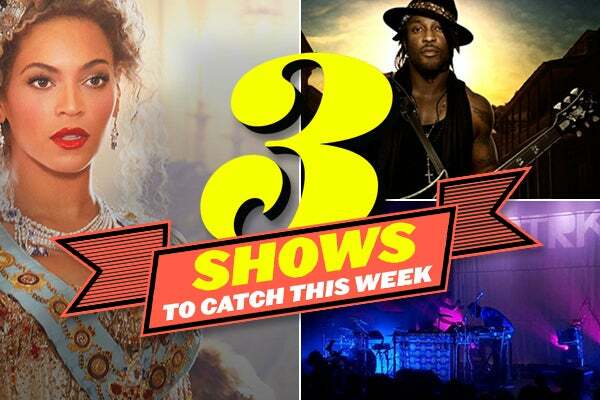 Photo: Via Ticketmaster, Beyonce, SBTRKT. SBTRKT's 2011 self-titled LP remains one of the best dance records of this decade. Live, Aaron Jerome's masked presence presides over a dance floor like few others in the business. Thursday, August 1, 10 p.m., Output, 74 Wythe Avenue (between N. 11th and N. 12th streets); Brooklyn . After a rough few years, D'Angelo is back in top form, performing material old and new with pitch-perfect power. His show in Williamsburg will have the always-reliable Questlove and Brainfeeder bassist-extraordinaire Thundercat filling out a fantastic bill. Thursday, August 1, 7:30 p.m., Williamsburg Park, 50 Kent Avenue (between N. 11th and N. 12th streets); Brooklyn. What can we say about Bey that you don't already know? Beyoncé just might be the out-and-out best performer in the world of pop music right now. What's more, she'll be headlining the stadium that her husband helped bring to Brooklyn. To put it simply, you have no excuse for missing The Mrs. Carter Show World Tour. Saturday, Sunday, Monday, August 3, 4, 5, 8 p.m., Barclays Center, 620 Atlantic Avenue (at Flatbush Avenue); Brooklyn; 212-359-6387. July 29: Heavenly Beat plays Cameo Gallery. July 29: Real Estate plays Maxwell's. July 31: Melvins, Baroness, and Honky play House of Vans. July 31: M. Ward plays Union Pool. August 1: Jamie Lidell plays (le) Poisson Rouge. August 2: Blue Hawaii, Empress Of, Solar Year, Weeknight play 285 Kent. August 2: Kisses plays Brooklyn Bowl. August 2: Jamie Lidell, Dan Deacon, The Stepkids play Prospect Park Bandshell. August 3: Midnight Magic, Mirror Mirror, and JD Samson play Brooklyn Bowl. August 3: Pop. 1280 plays Death By Audio. August 3: The Depreciation Guild (playing In Her Gentle Jaws in its entirety) plays Glasslands. August 4: Beck plays Prospect Park Bandshell.